5 Outdoor Lighting Ideas that Scream SPRING! With warm weather and grilling season right around the corner, who wants to be cooking up a steak by the light of a tikki torch, or string of Christmas lights? 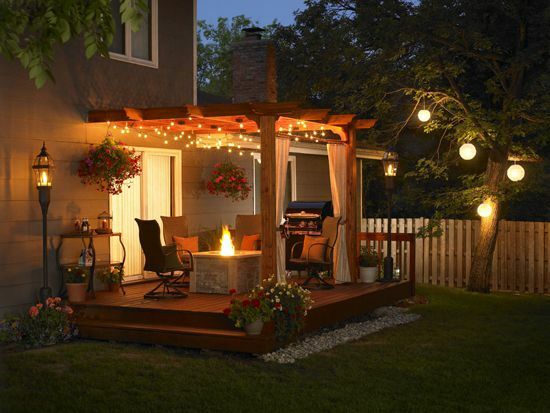 Here are five different outdoor solutions for your lighting that will be sure to brighten up your springtime get together's, and have the neighbors wondering how you did it! Aside from giving your yard a classy look, landscape lighting is great for deciphering where your yard ends and your driveway begins. If you have a curvy and/or poorly lit walkway, implementing landscape lighting can also double as an eye-catching safety measure for your guests. If you have an outdoor patio area, you're going to want to make sure its standout features pop. Brick or stone bars, retaining walls, and other bits of hardscaping are easily brought to life with professionally installed, or DIY (outdoor adhesive) lighting. Successful hardscape lighting will give you the double-take-worthy patio you've always wanted. Making something look great, as well as ensuring safety don't always go together very well, but with staircase lighting, you can expect both! Lighting up your outdoor staircase will be sure to add to the attraction of your patio, as well as eliminating potential falls- and that is pretty important when you're carrying a platter of burgers. String lighting is an easy, and also affordable way to give your backyard that splash of springtime you've been looking for. Whether you hang them from your trees or pergola, stretch them across your yard, or drape them over your hedges and/or bushes, using string lighting is sure to give your backyard gatherings a movie-quality aesthetic. Accent lighting is one of those things that is guaranteed to make things look fantastic! You use accent lighting you are wanting to emphasize certain features of your home, or you can use them as a focal point themselves. The LED "Ball" is an impeccable piece of accent lighting not only for its cordless design, but also because of its durability. You can arrange the balls with other pieces of outdoor décor, throw them in your pool, or spread them around your backyard to give it that perfects splash of modern.